If you’ve ever slowly dripped cold water into Absinthe and awaited its transformation from transparent to stunning opaque opalescence, you’ve encountered anethole in the wild. Anethole is responsible for what is described as the ouzo effect in a wide range of spirits. This happens because anethole is highly soluble in ethanol, but not in water. When a spirit such as pastris, raki, sambuca, or even gin (take for example Chicago’s Letherbee Distillers’ Letherbee Gin) is diluted, the anethole comes out of solution creating a cloudy emulsion. There was a point not long ago where gin distillers might have frowned upon cloudy gins and hazy gin and tonics. But now many – Letherbee included – make this a conscious design choice, to play up this property of ubiquitous botanicals such as liquorice, anise or fennel. Furthermore, the flavour of these ingredients – the cooling, slightly camphoraceous spiciness that most people recognise as ‘anise-flavoured’ has been common in gin since the 18th century. However, as often as gin drinkers tend to lump these disparate botanicals under the “anise” header, they all have their own unique qualities. Next time you taste anise in gin, take a second sip and see if you can discern just which anethole-containing-botanical is providing the flavour. Anise is a large flowering plant in the same plant family as several other important gin botanicals like coriander, dill and angelica. Its fruits, known as aniseed, inspired a wide variety of regional anise flavoured liqueurs. Nearly every culture of the Mediterranean region has its own type of anisette. But its use goes even further back. In the 16th and 17th centuries, Aniseed Water was as common as Juniper Waters on the shelves of European apothecaries. or black jellybeans. In addition to having a large amount of anethole (~90 per cent), anise also has traces of estragole, which contributes a fresh basil or tarragon-like note. Despite being the inspiration for so many spirits and drinks, true anise is not always the source of anise flavour in gins. Its name, star anise is completely unrelated to anise. It comes from an Asian evergreen tree and for centuries has been an inexpensive substitute for the former. As one might assume, star anise is star shaped, with each point of the star containing a seed. Though important for its flavour as far as gin and Chinese five-spice powder is concerned, most of the world’s star anise is grown because one of its constituent oils can be used to help in the manufacturing of the flu drug Tamiflu. Star anise has a high anethole content (~80 per cent) and has a sharper, but slightly sweeter flavour. Distilled star anise suggests notes of baking spice or gingerbread cookies. Because of its price, many distillers opt for star anise in their gin instead of anise; however, artfully done, star anise can bring a completely different aroma and flavour. Liquorice refers to the plant, not the generally anise-flavoured candy. Though anethole is a major component of this plant’s aroma profile, liquorice has much more complexity. The aroma has a waxy, flowery, almost sweet character with a bit of anise thrown in for good measure. 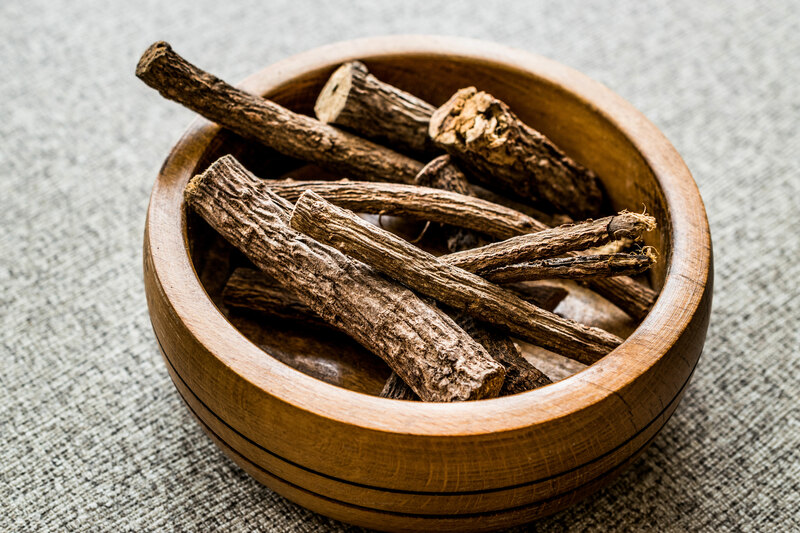 Liquorice root is useful as a natural sweetener and its inclusion in gin might be in large part due to that effect. Jensen’s Old Tom is based on an 1840s recipe uses a heavy amount of liquorice root as a botanical to impart the “Old Tom” sweetness and mouthfeel without any added sweetening. Liquorice is common – whether for flavour, sweetness, or both – especially in gins that originated in the 19th century. Fennel, the vegetable, looks a bit like celery with delicate fronds and a large white bulb at its base. The vegetable tastes slightly of liquorice when eaten raw. However, when most distillers talk about using fennel they’re talking about fennel seeds. When growing fennel for seeds, the plant is raised until it effloresces. The yellow umbrella-shaped flowers are then allowed to wither and brown. This is when the fennel seeds are ripe and at their peak essential oil content. The seeds are small, slightly greenish, and have a gentle, sweet liquorice flavour with more brightness. The seeds on average have a lower anethole content than some of the other botanicals discussed here. However, they also have more pinene and limonene giving them a more complex flavour profile. Distilled fennel seed can often be described as having a slight vegetal character in addition to the anise note. The complexity of fennel seed as a botanical has made it quite popular with distillers in recent years, appearing in some of the most prominent gin releases of the past few years on both sides of the Atlantic. Fennel seed can be so complex as to carry a gin. Death’s Door Spirits of Washington Island, Wisconsin prominently uses fennel seed as one of only three botanicals in its Death’s Door Gin. While relatively new to Europeans, the Anise Myrtle has been known for longer to Australians. Anise Myrtle refers to the leaf of a relatively rare rainforest tree, known locally as ringwood. The name Anise Myrtle itself was given to this tree by Europeans to note the anethole flavour of the plant’s leaves, which reminded them of aniseed back home. Anise Myrtle is described as having a “fresher Anise aroma” and “one of the highest known concentrations of anethole,” with some analyses suggesting it makes up 86 per cent of the leaf’s essential oil. While its use right now is limited to Australia, Anise Myrtle is growing in popularity in the US and the EU as an alternative to traditional sources of anethole in the aromatherapy industry. to express their local botanical heritage in their gins. Though these five might be among the most notable gin botanicals today that impart an anise flavour, it’s worth pointing out that anethole is incredibly common in the plant kingdom as a component of essential oils. Berkshire Mountain Distillers, makers of Greylock Gin, has experimented with Anise Hyssop in its products. The Botanist Gin includes Sweet Cicely among its botanical blend and yep – you guessed it – its leaves taste of anise. Even the flowers of common gin root botanical Angelica archangelica tastes slightly of liquorice. We haven’t even mentioned chervil of tarragon. Even among tasting professionals, differentiating between all of the aforementioned can be difficult – if nigh impossible – because each contributes the same aromatic compound. But the devil’s in the details. Hopefully next time you pick up a gin and taste that distinctive anise flavour, you can appreciate the diversity of the botanicals underneath that note.